Incidence of superficial aberrant radial artery has been reported to be 0.8-1%. , Its unawareness may lead to accidental intra-arterial injection of therapeutic drugs, complications and litigation. We report a case of aberrant radial artery cannulation, which was recognized early and managed. A 20-year-old male was scheduled for double valve replacement. After attaching standard monitors, an intravenous access was secured by an anesthesia technician on the radial aspect of the right wrist joint with an 18 G cannula after applying tourniquet [Figure 1]. An unusual backflow was noted after the removal of the tourniquet and the color of the blood was bright red. With the suspicion of the aberrant radial artery cannulation a fluid bag was connected, which showed pulsatile backflow into the tubing. This was further confirmed by attaching a transducer, which showed arterial waveform [Figure 2] and by blood gas sampling, which showed findings corresponding to arterial blood gas. 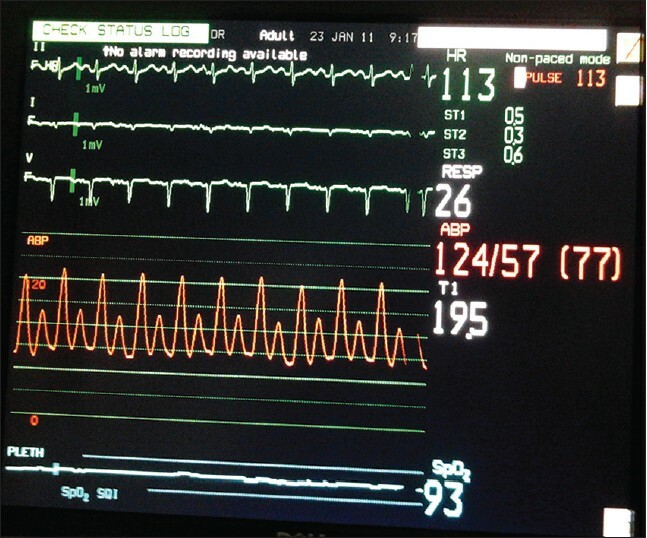 It was decided to continue with this line for arterial pressure monitoring for induction. Arterial pulse on the usual site of the right radial artery was feeble, but showed definitive flow on Doppler. The radial artery course was normal on the left side. An intravenous line was secured on the dorsum of the left hand with an 18 G cannula. After induction of anesthesia femoral artery was cannulated for further arterial pressure monitoring which was continued post-operatively. The cannula placed in the aberrant radial artery was removed in the immediate post-operative period. Treatment of inadvertent intra-arterial injection includes keeping the cannula in situ, local infusion of heparin saline and systemic anticoagulation with heparin. Other measure includes local anesthetics injection, calcium channel blockers, intra-arterial papaverine, stellate ganglion block and axillary plexus block. 1. Rodríguez-Niedenführ M, Vázquez T, Nearn L, Ferreira B, Parkin I, Sañudo JR. Variations of the arterial pattern in the upper limb revisited: A morphological and statistical study, with a review of the literature. J Anat 2001;199:547-66. 2. Wood SJ, Abrahams PH, Sañudo JR, Ferreira BJ. Bilateral superficial radial artery at the wrist associated with a radial origin of a unilateral median artery. J Anat 1996;189:691-3. 3. Sen S, Chini EN, Brown MJ. Complications after unintentional intra-arterial injection of drugs: Risks, outcomes, and management strategies. Mayo Clin Proc 2005;80:783-95. 4. Ghouri AF, Mading W, Prabaker K. Accidental intraarterial drug injections via intravascular catheters placed on the dorsum of the hand. Anesth Analg 2002;95:487-91.